This recipe was inspired by a recent question I received from one of my twitter followers, Terri. She asked if I had any detox smoothie recipes that didn’t seem so disgusting. Nothing is quite like watermelon on a hot summer day, which is the primary ingredient of this smoothie. Watermelon is a great whole body cleanser, and particularly effective at cleansing the kidneys and liver. Cleaning out the toxins currently present in these organs frees them up to properly clear toxins in the future. It’s a win-win. There are even 3-day watermelon detox diets for those that really want to push the envelope. Next, we have ginger, well known as a digestive aid, but also great for purging toxins from the body. As with watermelon, lemon juice also helps detoxify the liver. 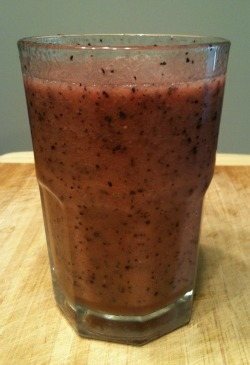 Frozen blueberries made their way into this smoothie not because they’re great cleansers, but for all their good nutrition. Rounding things out is a dash of sea salt for some added minerals. Smoothies like this are a great way to do light detox work on an ongoing basis. If you’re experiencing a heat wave like we are this summer in Michigan, this slushie like smoothie is perfect for cooling you off. Enjoy! Place the ingredients into your high speed blender and blend for anywhere from 30-45 seconds – or until the desired consistency is reached. Let me know what you think of this tasty ginger watermelon smoothie by leaving a comment below. Happy Blending! I want a watermelon and ginger lemon three day detox…. Please help do I eat or just drink in the morning before I eat? Thank you M.K. I’m not familiar with the three day detox you alluded to so I can’t offer advice. Yummy! I love ginger but I added just a tad too much. Stick with the 1tsp. Really good for me because I have diverticulitis so anything that aids with digestion is great! Thank you. You’re welcome, Lizzy. Yes, don’t overdue it on the ginger. This was delicious, ginger gave it a fizzy taste, not too sweet and not bland at all…perfect! I tried this, substituting Saskatoon Berries for the Blueberries, because that’s what I have in the freezer. I eliminated the salt due to being on a very low – to – no sodium diet. Then I used the prepared smoothie to make a tray of ice cubes, so as not to water down the flavour. It’s wonderful. A smoothie that doesn’t smell like uncooked cabbage rolls. Awesome, Auntie Afia! Love the substitutions.